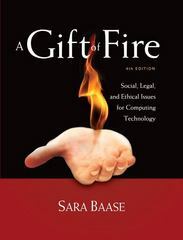 A Gift of Fire 4 Edition A Gift of Fire: Social, Legal, and Ethical Issues for Computing Technology, 4e is ideal for courses in Computer Ethics and Computers and Society. It is also a useful reference for computer science professionals or anyone interested in learning more about computing technology and its overarching impact. Sara Baase explores the social, legal, philosophical, ethical, political, constitutional, and economic implications of computing and the controversies they raise. With a computer scientist's perspective, and with historical context for many issues, she covers the issues students will face both as members of a technological society and as professionals in computer-related fields. A primary goal is to develop computer professionals who understand the implications of what they create and how it fits into society at large.